We often blame our fate saying that ‘it was not meant for me’ when we lose an opportunity in life. What if we could find out what our fate holds? The fate line can reveal what will be the important trends in our life. Palmistry says that there are seven varieties of fate lines which have separate influences on an individual. Deep fate line in a native’s palms indicates that he or she may achieve paternal wealth and other profits from various means. Elderly persons will help enhance the success of the individual. A native with a light fate line in his hands indicates that he or she may have to undergo failures and difficulties in life. Due to unsuccessful attempts in his life he may often feel hopelessness. But a strong Sun line in the native’s hand will provide him success. In this way presence of other lines and mounts may also alter the results. 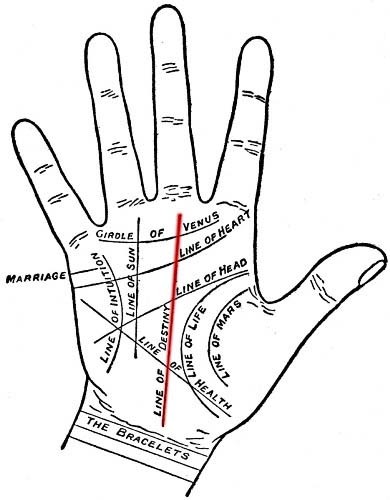 According to palmistry if the fate line splits into two parts and create a ‘y’ shaped structure in a native’s palm then it indicates that the person may suffer from confusion and contradiction. He may be indecisive as his fate lines may not let him take a strong decision and stand by it. In short it can be said that he may be riding on two boats at a time. Zig zag fate line in a hand suggest that a native may experience many ups and downs in his or her life. He/She can attain success only after defeating the problems and conflicts in life. The native may not get the fruits of his/her efforts easily. This type of fate line also says that at crucial times of decision making the native’s thoughts may become vacillating. Broken fate line in a native’s hand indicates a danger. A breakage in a fate line means the native may face an accident at a certain point in life. The accident may cause physical damage or may even put the native’s life in danger. Natives who have a broken fate line should be very careful. A native may face many ups and downs in his life if the fate line is chained in the palm. He might swing between failure and success. He may successfully carry out a task and may sometimes face immense problems doing a simple task! Palmistry says that every people has a fate whether the fate line is visible or not. The natives who don't have visible fate line can get information about their future by considering other lines of the palm. So, there is no need to worry for those who don’t have visible fate line. A deep and strongly-etched Fate line represents a person who settles down into a disciplined pattern of life quite early.However, a weak or faint fate line suggests a person who is restless and tends to change jobs quite often. A Fate line that begins at the very base of the palm depicts a person who has planned out his future at a very young age. If the Fate line abruptly ends at the head line, it denotes a person who somehow traveled away from his ambitions between the age of 30 to 40 years. In most people, you'll find the Fate line trailing off at the heart line. Very rarely, you come across people with a Fate line which extends all the way to the middle finger. Such people may be seen to remain active even in their old age. Sometimes, you may see two Fate lines on a palm. This is mainly found in the case of people who pursue multiple careers simultaneously. Such a double Fate line is considered to be a lucky sign because it promises a distinguished career. Finally, if the Fate line is absent; it denotes the unstable nature of a person. No wonder, Fate lines are absent in the palms of most alcoholics and drug addicts.